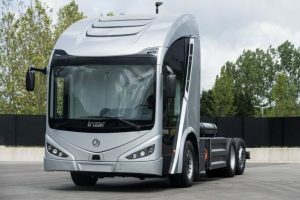 Spanish coach and bus builder Irizar has presented an electric truck. After VDL that is the second coach and busbuilder that presents an electric transport sollution for cargo. The truck was presented during the opening of a completely new e-mobilityfactory in the Spanish town Aduna. Irizar invested 75 milion Euro in the new plant where electrical vehicles can be built. For the time being the production of trams and busses is leading but from 2019 on the electrical trucks are going to be produced. The ie-Truck of Irizar is a 6×2 chassis that is mainly for the collection of waste. The truck has a low entry cab that makes it look like the front end of a bus. The engine is 230 kW and there is 120 kWh on battery capacity on board. Irizar claims a radius of 200 km. The CNG range extender can make the radius much bigger.